Similar to previous years (see NGO Monitor reports for 2014, 2013, 2012), many politicized NGOs and well-known charities have been exploiting the 2015 Christmas season with anti-peace campaigns, some of which glorify terrorism. Groups such as Sabeel (funded by Sweden, via Diakonia, and the Netherlands via ICCO and Kerk in Actie), War on Want (funded by UK, EU, and Ireland), Adalah-NY, Kairos Palestine, and Amos Trust are again using religious and holiday themes to demonize Israel. These organizations utilize inflammatory and offensive rhetoric in their Christmas carols, holiday messages, appeals, and religious imagery. At the same time, their messages strip the context, omitting references to deadly Palestinian terrorism and other violence against Israelis. They fail to condemn the escalation of attacks against civilians in the last quarter of 2015 – stabbings, car rammings, and drive-by shootings. For example, many of these so-called Christmas messages allege that the security barrier causes harm to Palestinians, while failing to mention its role in protecting civilians against terror attacks. The abuse of Christmas messages is part of a broad international campaign of political warfare conducted against Israel in some churches. Palestinian Christian NGOs, such as Sabeel and Kairos Palestine, provide the theological and ideological frameworks for these attacks. Despite claiming to promote moral agendas with messages of peace, these NGOs and charities actually abuse this holiday and religious symbols. Their intolerant and theologically charged messages aggravate an already polarized and violent conflict. The following politicized, pro-Palestinian NGOs exploit religious themes in order to demonize Israel and encourage unwarranted and counter-productive political warfare against Israel. 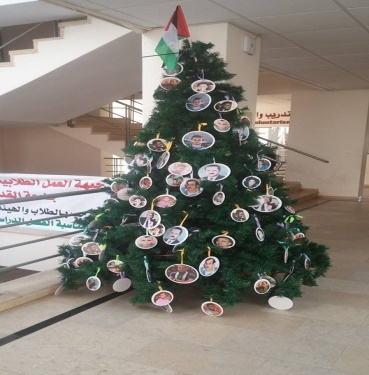 Al Quds University, which has received funding from the EU’s Partnerships for Peace program, displayed a “martyrs tree.” The tree’s decorations included pictures of terrorists who had conducted attacks against Israeli civilians over the previous few months. The tree was revealed in an event attended by the University’s President and the Mufti of Bethlehem. Kairos Palestine is an NGO that promotes the 2009 Kairos Palestine document, drafted by a small group of Palestinian Christian clergy. It calls for BDS (boycotts, divestment, and sanctions) against Israel and denies the Jewish religious and historical connection to any part of the Land of Israel. The Kairos Palestine document also ignores more than fifty years of Jewish-Christian reconciliation and repeats ancient antisemitic themes, including the dogma that Judaism was superseded by Jesus and Christianity (“replacement theology”). Sabeel claims to be an “ecumenical grassroots liberation theology movement among Palestinian Christians,” which “encourages Christians from around the world to work for justice and to stand in solidarity with the Palestinian people.” Sabeel is active in anti-Israel political campaigns, including church divestment campaigns, and supports a “one state” formula, meaning the elimination of Israel as a Jewish state. HCEF is an ecumenical group of American Christians. It promotes the Kairos Palestine document, and applies a Palestinian liberation theology that fuses Christian theological antisemitism with Palestinian nationalist ideology. 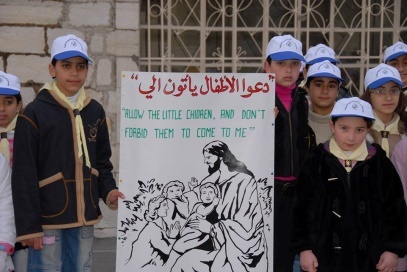 In a report “Palestinian Children Celebrate Christmas Despite Current Conflict During HCEF’s 11th Annual Journey To Bethlehem,” HCEF claims, “Unfortunately, due to the intensified Occupation, many of the schools and scout groups that typically participate in the Journey were unable to attend this year.” HCEF fails to mention that the movement restrictions were the result of the intensification of Palestinian violence in the Jerusalem area. 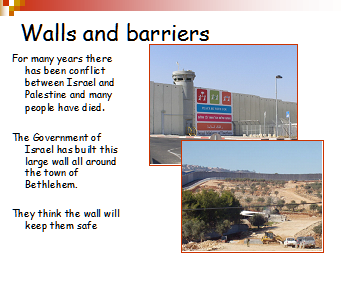 Also included is a slideshow, “A Bethlehem Story,” which accuses Israel of causing the Christian population to decline (when in fact it has grown) and compares modern day Bethlehem to Jesus’ lifetime. Embrace the Middle East runs schools, and organizes programming and other community development initiatives. It also promotes an entirely biased and distorted view of the conflict based solely on the Palestinian narrative of victimization and Israeli aggression. EME’s Advent Resource Pack includes a story that compares the ”occupying power” of the Romans in the time of Jesus to the Israeli-Palestinian conflict (with Israel in the role of the Romans and Palestinians likened to Jesus). AFSC actively promotes BDS campaigns against Israel; accuses Israel of “apartheid against Palestinians”; and advocates for the “right of return,” meaning the end of Israel as the nation state of the Jewish people. AFSC’s General Secretary Shan Cretin, in her Christmas 2015 email newsletter, used AFSC’s BDS activism as a prime example of the work donations would support. War on Want (UK) continues to promote its politicized Christmas cards depicting the security barrier paired with traditional Christmas images. The UK Palestinian Solidarity Campaign (PSC) continues to sell a politicized Christmas card related to the conflict. If Americans Knew continues to sell their politicized Christmas cards depicting the three wise men unable to reach Bethlehem due to Israel’s security barrier. At the height of the holiday season, NGOs, well-known charities, and church groups are once again exploiting Christmas to conduct political warfare against Israel. Yitzhak Santis asserts that the political warfare attacks against Israel this Christmas season were made possible by extensive governmental funding of highly politicized NGOs. NGOs (non-government organizations) and well-known charities are exploiting the 2013 Christmas season with political warfare against Israel. Groups such as Christian Aid (UK), Kairos Palestine, Sabeel, War on Want (UK), Amos Trust, and Adalah-NY are once again using theological themes to advance immoral anti-Israel campaigns and, in some cases, antisemitism.